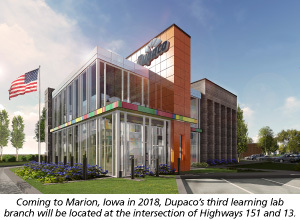 Dupaco Community Credit Union plans to build a full-service learning lab branch as part of a new development near the intersection of Highways 151 and 13 in Marion. The retail space is expected to open in early 2018. Dupaco expects to begin construction on the two-story, 7,140 square foot branch in August. The new building will be among the first as part of a new, 20-acre mixed-use development called Squaw Creek Crossing, which is situated on the northeast side of the intersection. A golf driving range previously occupied the site. While the operation hours are not final, full-service Dupaco branches are primarily designed to help members understand money and improve their financial positions. Some back-office support employees are also expected to occupy the space. The planned learning lab branch will focus on teaching members how to control their money through hands-on demonstration of Dupaco desktop, tablet, and mobile deposit services, and more. The branch also will feature a service delivery technology called live video tellers, which allow livetellers to conduct real-time, face-to-face video transactions from a distance. Dupaco employees located at a central location in Dubuque remotely operate the Marion lobby and drive-through video teller machines. The new live video teller technology is intended to boost the credit union’s mission to improve each member’s financial position, according to Dupaco Chief Marketing Officer David Klavitter. Signage and lighting which use LED illumination to conserve energy and reduce electricity costs by more than 35% annually. 501 4th Ave SE in Cedar Rapids. Very Happy to hear this bit of Good News. Congratulations!